January 27, 2012 By This post may contain affiliate links. 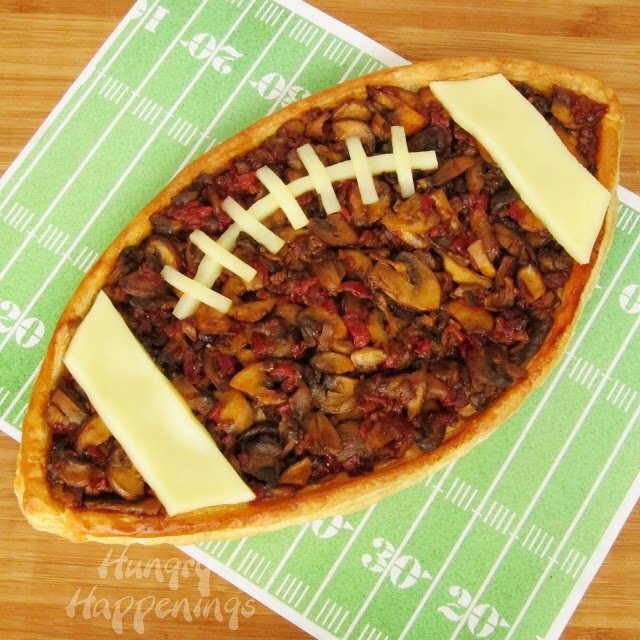 This Madeira Mushroom filled Football Tart is for all the mushroom lovers at the party. There can never be enough of them in a dish, and this appetizer proves it! If you would have told me six years ago that a mushroom dish would be one of my absolute favorite things to eat, I’d have laughed. I hated mushrooms – as I knew them. I still don’t enjoy eating raw mushrooms, but once I learned how to properly cook them to enhance all of their savory goodness, I began to appreciate them – even love them. A few years ago, I was helping a friend make food for a party and she asked if I would make some bite size mushroom tarts. I followed the recipe’s directions and sauteed the mushrooms with onions, garlic, butter, olive oil, and some roasted red peppers. I deglazed the pan with some white wine and allowed it to cook off before adding Parmesan cheese and heavy whipping cream. I tasted it with hesitation, taking the tiniest of bites. Then I immediately dug in and got a bigger spoonful. It was better than I would have ever imagine and I was hooked. I began cooking with mushrooms and trying other mushroom dishes at restaurants. One day I ordered the Madeira Mushroom Chicken from the Cheesecake Factory and my love affair with Madeira mushrooms began. I, as you know, love sweet, and when sweet (Madeira wine) and savory (caramelized mushrooms) meet, I am in heaven. I could eat this combination of wine and mushrooms all the time, and have been known to cook them several times a month. I love them on top of filet mignon or chicken, and baked on top of or inside filo dough, puff pastry, pie crust, crescent dough, and pizza dough. My Madeira Mushroom Pizza made on a Mama Mary’s Pizza Crust was the first of my original recipes to win a recipe contest. 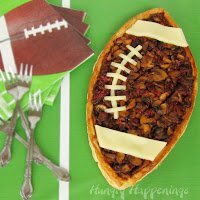 I thought about making a football shaped version of that pizza for this post, but had a package of Pepperidge Farm’s Puff Pastry in my freezer which was super easy to cut into a football shape. I baked it, topped it with the mushrooms and added Mozzarella cheese decorations. It is a pretty easy recipe to make for a Super Bowl party, but I will let you know that in order to do this recipe justice, you need to have patience. I browned my mushrooms in 5 separate batches in order to caramelize them properly. The flavor is so worth the effort. The good news is that you can prepare the mushrooms up to a few days before your party then just bake the pastry crust, fill it with the mushrooms and heat it through, and add your decorations just before serving. This idea is very versatile. You could skip the mushrooms (gasp) and fill your tart with other brown ingredients. A layered Mexican dip would work or a Philly cheese steak, or any kind of meat topped pizza. If you love the idea of the Madeira mushrooms, but don’t need a football, you can just make a rectangle tart, or cut the dough into a shape, like a teddy bear for a baby shower. *You will need thin slices of white cheese to decorate your tart. I cut thin slices from the long edge of an 8 ounce block of cheese then cut them into the desired shapes. If you uses cheese slices, you’ll need rectangle slices. Lightly dust a cutting board with flour. Unfold the thawed sheet of puff pastry pinching together the seams, if necessary. Use a rolling pin to roll the pastry dough out into a 12″ x 14″ rectangle. Use a pizza wheel or knife to cut out a football shape in the center of the dough being sure to leave 1/4″ of dough on either side. 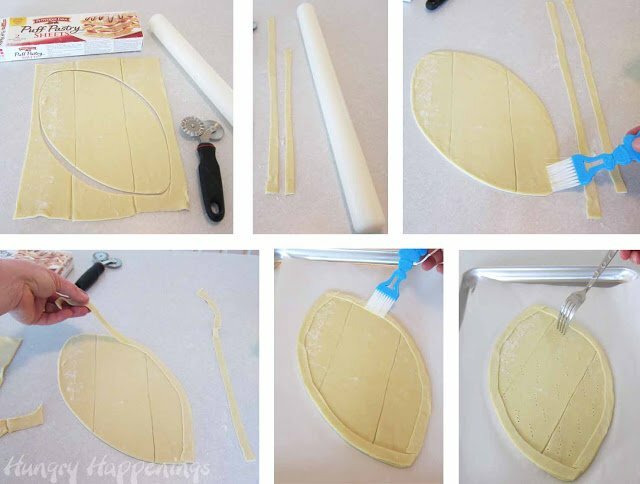 Cut 1/4″ wide strip from each side of the dough. Use a rolling pin to gently roll the strips to increase their length. They need to be long enough to to reach from one end of the football to the other. Brush egg wash, milk, or cream all along the edge of the football. 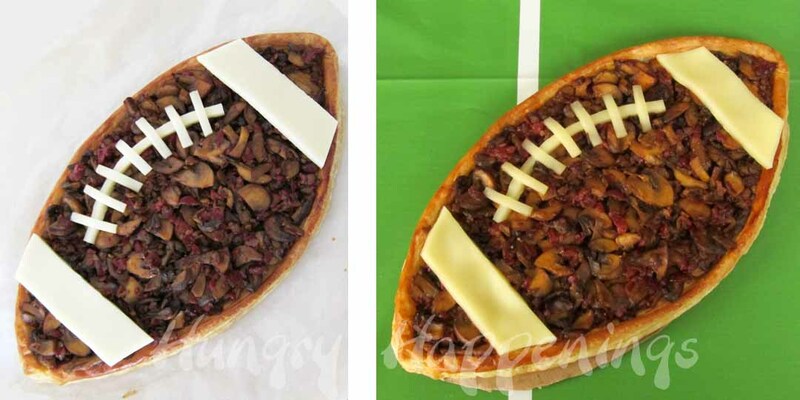 Lay one strip on either side of the football dough. Cut off excess dough. Lift up football and place on a parchment paper or Silpat lined baking sheet. Brush egg wash over the surface of the football. Use a fork to prick holes all over the dough not including the border. Refrigerate for 30 minutes. If you are going to bake your football as soon as your filling is ready, preheat oven to 400 degrees now. Clean mushrooms with a damp paper towel. Remove stems from Shiitaki mushrooms. Slice and set aside. Heat 1 teaspoon olive oil in a 12″ skillet over medium high heat. Chop Pancetta into small pieces and sprinkle in hot pan. Cook, stirring often, until crisp. Use a slotted spoon to remove crispy Pancetta from skillet. Drain it on a piece of paper towel. Set aside. In the same hot pan add shallots and saute until translucent. Add garlic and saute for about 30 seconds. Add finely chopped roasted red peppers and cook just until all the liquid evaporates. Pour mixture into a bowl and set aside. In the same hot skillet add a little over a teaspoon of oil and a pat of butter. As soon as the butter melts add 3 ounces sliced mushrooms (about 1/5 of your total.) You want one layer of mushrooms in the pan with room around each mushroom. If you crowd the pan, the mushrooms will steam instead of caramelize. Take your time here to get good browning on each side of your mushroom slices – this is flavor!!!! Once these mushrooms are brown, remove from pan. Add more oil and butter to the pan and repeat the process until all the mushroom are browned. Return mushrooms, Pancetta, and roasted red pepper mixture to the skillet. Pour in wine, beef broth, and balsamic vinegar. Scrape the bottom of the pan to remove all the brown bits and bring to a boil over medium high heat. Reduce the heat to medium low and cook, stirring occasionally, until almost all of the moisture evaporates. Remove from the heat and add Parmigiano-Reggiano cheese. Stir to combine. At this point you can either make your tart or refrigerate your mushrooms until ready to use. To make the tart, pre-heat oven to 400 degrees. Bake the pastry for 15 minutes until it is golden brown. Spoon the mushrooms over the center of the tart. Bake for an additional 8 minutes if the mushrooms are warm, and up to 15 minutes if they are cold. Cut slices of cheese to make the laces and stripes on the football. Set on the hot tart to melt the cheese slightly. Serve hot. WOW! How amazing is this? I have to agree with you on mushrooms. I am still not the biggest fan, but if they are made right I will gobble them up. Thanks for linking up this incredible dish! This looks soo delicious! I love mushrooms, but your other suggestions of layered bean dip or philly cheesesteak have my mouth watering!! The guys will love this! So festive for kick off. Thanks so much for sharing on Momtrends! You always come up with such unique ideas.. I am so impressed! I love the creativity! I bet the flavor will be as amazing as the presentation. Great post! CONGRATULATIONS!!! Your recipe is being "featured" today on Today's Menu Round Up. Please come over and grab a "featured" button. Thank you for sharing your recipe with me at Cast Party Wednesday! Hi Sheryl – thanks so much for featuring this recipe on your Menu Round Up. I'll be back to link up at Cast Party Wednesday with some Valentine's Day treats. This looks awesome!!! I am totally going to try this! Thanks for linking up to TGIF. Have a great week!! We are a mushroom loving family, and this is going on our Super Bowl Menu! Looks delicious!! 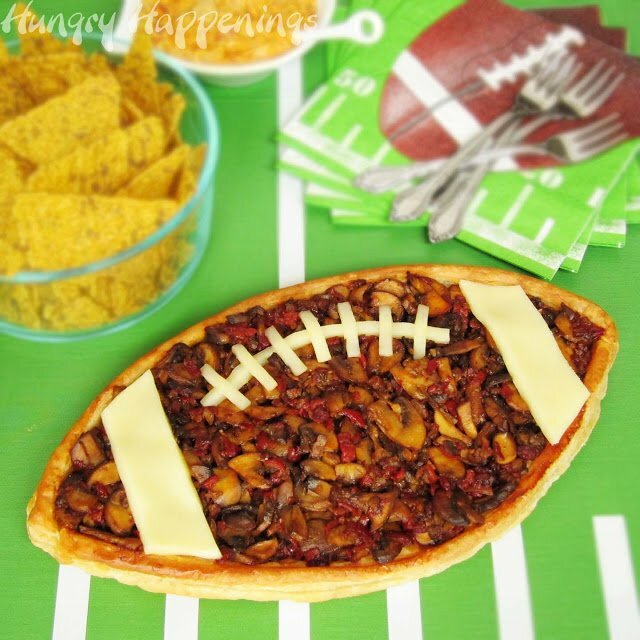 Thanks for posting at my Super bowl Eats and Treats Party! Wow that's some awesome game day food. Thanks for sharing at Bacon Time. Sigo tu blog desde hace mucho tiempo y me encanta todas las cosas tan originales que haces. Enhorabuena, todo es muy bonito y apetecible. He puesto un enlace desde mi blog al tuyo. Pasa a verlo cuando quieras. Thanks Almeria, I am so happy to have you following my blog. I'm glad you like my ideas.